Depart from your Hanga Roa hotel to begin your journey into the heart of Easter Island’s historical legacy. Venture to Ahu Akahanga in an air-conditioned minivan alongside your accomplished archeologist guide; explore the enthralling grounds, visiting the 59-foot (18-meter) platform to discover a dozen moai statues and the reputed burial ground of King Hoto Matu’a. After thorough exploration of the curious scene, follow the curvaceous coastline to Ahu Tongariki, the island’s largest ceremonial site. 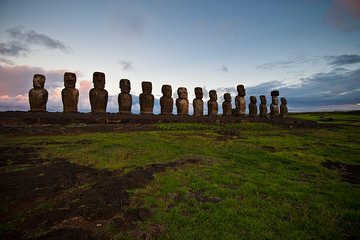 Marvel at the prominent postures of the 15 maoi sculptures, learning about the violent tsunami that almost destroyed the site in 1960. Next, venture inland to the visionary volcanic slopes of Rao Raraku to appreciate the rugged beauty and selection of sculptures. Enjoy an exhilarating hike into the stone pit of the quarry, observing the partially buried torsos and protruding heads of over 300 statues. Arrive at your final stop of Anakena after a short and scenic drive; admire the series of vibrant statues before relaxing upon the silken sands of the beautiful beach. Swim in the crystal clear waters and appreciate the vibrant red of the volcanic rocks before returning to your hotel in the comfortable minivan. If you have very limited time on the island and are really only interested in going to X site and taking pictures before moving on to the next site, then this is a great tour. The tour visits some amazing places and there is time to take pictures but that's about it. The tour is very perfunctory, with the guide/driver requiring everyone to stand in specific places while he recited the required information before moving on to the next spot. It was clearly all from a script - when I asked a question about a site that we passed that we were not visiting, I was told that it wasn't relevant for the tour. There is no time to really explore most of the sites that are visited and a lot of time is wasted trotting behind the guide as he walked to the next lecture point. The lunch was OK but definitely not worth the increased costs. And given that it was winter, stopping at the beach for almost 2 hours was a big waste of time, especially since we had just had lunch and so you couldn't even use up time by having lunch. Not worth the price and there are better tours out there - look up Easter Island Tours instead. WORST TOUR GUIDE EVER. And believe me when I tell you that I have been on tours all over the world and this guide was the worst. I would like to tell you what the guides name was but he never told us. He walked into the hotel lobby and said, Do you have your park pass? He told us absolutely nothing for 8 hours. I could overhear other guides giving amazing information and history and my husband and I felt very cheated that we had this guide through Aku Aku Tourismo. He was NOT a guide. He was a minder....someone who kept us on a timeline. When we went to Anakena Beach he let us off the bus and did not say ONE THING about what we would see. It was basically like that the entire day. He walked ahead of the group the entire day, trying to hurry us through. When he would utter something it was with no enthusiasm and seemingly annoyance that he had to be with us for the day. He sat on the bus quietly as we passed incredible sights that he told us nothing about. Such a disappointment. Luckily we took another tour the next day that had some crossover so that I learned about the history of the island, Rapa Nui, and Moai. This was one of the best tour I have done. Very well organaised, very informative with very friendly group. Guide was great and answered all questions any pf us asked about Rapa Nui people and their history.!!! I had great hopes for this tour with a driver and a local Rapa Nui guide. It turned out to be minimal information/photo stops. The tour was conducted in Spanish and English. When the Spanish speaking folks asked a question, they got a lengthy answer which was never translated for the English speaking folks. The stop at the beach and the lunch were great. This was a third day tour for me so I knew we weren't getting a lot of information. It is a nice tour if you have only one day to see the highlights. Nice tour. Just make sure to get your park pass beforehand! Excellent tour. Highlight of our visit to Easter Island. Good 1 day tour!! Went with about 15 others. The day was beautiful and enjoyed the hikes and free time to explore on your own. Lunch was fine. So much history on such a small island. Loved it. The sights are beautiful, and the guide has a great personality, but there are some issues in translation that don't allow to connect with all the history sorrounding the island's history. I only had one full day on Easter island, this tour was amazing because it took us to all the main sites, the tour guide spoke good English and gave us knowledge about the sites we went to, our bus driver looked like Indiana jones which made it feel more like an adventure. Anakena beach was amazing very tropical with palm trees, but I wish we had more time there, it was our last stop before heading back, we only had about half an hour to go for a swim and relax on the beach. My favourite place was rano raraku, which was where they carved out most of the islands Maoi statues, it was a hill surrounded by Maoi statues and amazing to see most of the statues were half buried in the dirt and made it an exciting place to visit, there was one statue which was the, biggest on the island standing at 8 meters high. This tour was a great way to experience the major sights of the island. Wonderful tour guide and excellent info provided. The quarry was definitely the highlight!